The 1918 World Series featured the Boston Red Sox, who defeated the Chicago Cubs four games to two. The Series victory for the Red Sox was their fifth in five tries, going back to 1903. The 1918 Series was played under several metaphorical dark clouds. The Series was held early in September due to the World War I "Work or Fight" order that forced the premature end of the regular season on September 1, and remains the only World Series to be played entirely in September. The Series was marred by players threatening to strike due to low gate receipts. There were also rumors of a "fix", but there was no solid evidence and, with the war dominating the news, nothing came of it. It would be another season before baseball's relationship with gambling would erupt in a major scandal. Pete Alexander of the Cubs did not play in the Series. The Chicago home games in the series were played at Comiskey Park, which had a greater seating capacity than Weeghman Park, the prior home of the Federal League Chicago Whales that the Cubs were now using and which would be rechristened Wrigley Field in 1925. The Red Sox had played their home games in the 1915 and 1916 World Series in the more expansive Braves Field, but they returned to Fenway Park for the 1918 series. Game 1 of the 1918 World Series marked the first time "The Star Spangled Banner" was performed at a major league game. During the seventh inning stretch, the band began playing the song due to the fact the country was involved in World War I. Though the song was not named the national anthem until 1931, this game marked the first time it was played in any venue. The winning pitcher of Game 1 was none other than Babe Ruth, who pitched a shutout. 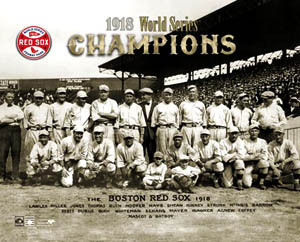 1918 would be the last Red Sox World Series Championship until 2004. The drought of 86 years was often attributed to the Curse of the Bambino. The alleged curse came to be when the Red Sox traded the superbly talented but troublesome Babe Ruth (who was instrumental in their 1918 victory) to the New York Yankees for cash after the 1919 season. Through the 2009 season, the Cubs are still waiting to win their next World Series. The Cubs, who last won in 1908, won the National League but lost the Series in 1929, 1932, 1935, 1938, and 1945. The Red Sox, who had won the American League but lost the Series in 1946, 1967, 1975, and 1986, finally won the World Series in 2004 and then won again in 2007. In the wake of America's entry into World War 1, the U.S. government called for a shortened season (ending on Labor Day) as well as an accelerated Series to take place immediately after. The perennial Fall Classic was temporarily transformed into a "Late-Summer" version and ran from September 5th to the 11th. In the first of many, the 1918 season was the first to show the effects of wartime on baseball. Many of the league's elite players were called up to serve their country and the overall quality of teams suffered as a result. Still, America's national pastime carried on smartly while helping to raise money (and the spirits) of concerned citizens everywhere. More than just a game, baseball would serve this role time and time again for many years to come. Despite their thinning line-ups, Boston's Beantown Bombers had dominated the American League on the way to their fifth World Series appearance. With an undefeated post-season record of 4-0 (they had won as both the Red Sox and the Americans) they were primed and ready for #5. With an elite pitching staff including Carl Mays, "Sad" Sam Jones and "Bullet" Joe Bush, not to mention the multi-talented Babe Ruth, Ed Barrow's team had won the shortened American League pennant race with a 75-51 record. Ruth split time between the outfield and the mound for the first time in his young career and managed to toss thirteen wins, bat .300 and hit a league leading eleven home runs. Their National League rivals, the Chicago Cubs were returning to the big show with an impressive 84-45 tally and an equally promising group on the mound. "Hippo" Vaughn had led the National League with twenty-two victories and was backed up by Claude Hendrix with tweny wins and Lefty Tyler with nineteen. The Cubs opened Game 1 at Comiskey Park, home of the cross-town rival White Sox, rather than their own Weeghman Park (later named Wrigley Field) due to it's larger seating capacity. Trading ballparks was not that unusual back in the day, as the Red Sox had chosen Braves Field over their own Fenway Park for their previous two Series appearances. Babe Ruth continued to build on his post-season legacy by extending his consecutive scoreless innings from thirteen to twenty-two against "Hippo" Vaughn in a 1-0 victory. Lefty Tyler managed to even it up the following day by throwing a six hit, 3-1 decision. Vaughn returned for revenge in Game 3 backed by his teams newfound momentum, but fell short after losing a 3-1 heartbreaker to Carl Mays. A well-rested Ruth returned to the mound for Game 4 and increased his scoreless streak to a record twenty-nine consecutive innings with a 3-2 win that also featured a great performance at the plate. The Babe had delivered the winning hit as well with a huge two run triple in the fourth. Boston was now up three games to one. Vaughn finally had his revenge in Game 5 tossing a five hitter and blanking the Red Sox with a 3-0 triumph, but it would be all the Cubs could muster. Game 6, would be their last stand as Mays buried the hatchet in the form of a three hit 2-1 triumph that ended the Series and crowned his franchise as five-time World Champions. Boston's grand finale almost didn't take place as the game was delayed due to a heated players debate over gate receipts. Series shares would be reduced drastically because, for the first time, all first-division clubs shared in the revenue. Without a doubt, pitching was easily the most notable statistic of the 1918 Series. Boston's pitchers had combined for an impressive 1.70 ERA and Chicago's boasted an even better 1.04. Neither team scored more than three runs in a game and there wasn't a single homerun in all six. The victorious Sox batted a miserable.186 and the losing Cubs swung a lowly .210.